Writing quilt patterns is a mystery to me sometimes. Yet, not in the way you might expect. The last pattern I published was STAR'D, which has been very popular; but almost every time that I stop into my local quilt shop, I hear the same thing. Kristy, I got another request this week from a customer asking when you will be writing a version of STAR'D that includes different sizes (Twin, Queen, King). You see, STAR'D includes the instructions for a lap size quilt measuring 50" x 60". When I wrote it, I thought about adding information about how to make it larger, like I had with my other patterns. Yet, I assumed that people would just buy more background fabric and make it larger themselves, case closed. Clearly I assumed too much. So I guess what I'm wondering is what do you expect from a pattern? I want to hear from you, so leave me a comment below, or feel free to send me an email. I'm with you Kristy, I would have assumed that peeps would have bought extra background fabric to make it bigger, maybe even add a few more flying geese. Or a extra star or two. It probably depends on peeps confidence levels, or their 'what the hey, I'll give it a go anyway' levels. 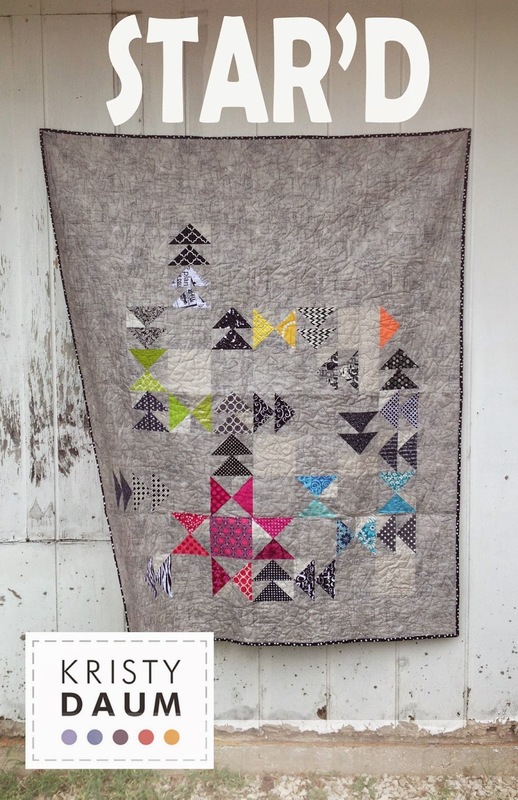 Whatever you choose to do, keep up the good work, your Mazed quilt was the first quilt pattern I ever took the plunge to buy and make and I still love it. I'm able to scale up a pattern & it would be an easy thing to do with this pattern, I can see why you didn't see the need to include upsizing for Star'd. With more complex patterns it's certainly a bonus if sizing options are included but it's not a necessity. I guess it makes sense to offer the options with all patterns to keep everyone happy though. When i was a younger (newer) quilter i would have expected size options. Then i was a traditinal quilter. Now i feel confident enough i could just add more of the same to make the size needed. Wonder if those that are asking are newer quilters or those just getting into Modern quilting and need that extra information. Kristy, I love your design and size just the way it is. And, since this is such a modern quilt, I would think a modern quilt maker would want to add their own twist to enlarge the pattern to make it their own. Hi Kristy- There may be a perception that you are getting "more value" with size options. Fabric is so expensive, I often look at how many yards would be required before I make my purchase of the pattern. Often this is the decider on purchasing a pattern that I am on the fence about. Hi Kristy, I haven't tried any of your patterns but I am a very visual person so I really like/need diagrams in my patterns. Even a diagram of how to cut the pieces out of your fabric most efficiently. It sounds dumb but I had a pattern that showed exactly how to cut the fat quarter into all the various sizes needed and it was super helpful! :) I don't usually care if multiple size options are presented, I bet lots of people see that beautiful quilt and want to amke it for their bed!